British Made Blankets and Throws – Hainsworth Textiles and Scarlet and Argent / John Lewis Blankets / Melin Tregwynt Mill / Witney Blankets / etc. Founded in 1783 Royal Warrant holders A.W. Hainsworth & Sons Ltd. manufacture a wide range of wool and textile products for both home and international markets. Best known for manufacturing the scarlet cloth from which the Queen’s guards uniform is made, Hainsworth manufacturers – protective fabric for fire services and military personnel; snooker and pool cloth; woollen coffins; car headlining cloth for the likes of Jaguar, Austin and Bentley; blankets; Newmarket horse blankets; interior fabrics; curtain fabric; military uniform cloth; ceremonial uniform dress cloth; tribal blankets; textiles for the theatre and cinema industries; specialised industrial cloth such as biscuit cloth, a woollen baize used for conveying biscuits; academic scarf cloth; blazer fabric; fabric for clothes making; fabric for making into re-enactment clothing; uniform caps; hats and badges; hot air balloon fabric; table coverings; floor coverings, hotel blankets; laundry textile products; piano baize for companies like Steinway and Renner; gaming and card table cloth; cabinet linings; etc. As far I can tell all their fabrics are made at their mill in West Yorkshire. Trade but they also have a retail site selling finished products. Hainsworth also manufactures the historic Hudson’s Bay Point Blanket, which has iconic status in Canada. I am not sure how much Hainsworth use British wool. Hainsworth is one of the few companies still making blankets in the UK. Hainsworth also make Newmarket Horse Blankets in England. Each Scarlet and Argent piece is created exclusively and entirely in their specialist Yorkshire mill. Woollen blankets, throws and accessories (cushions, teddy bears and hot water bottle covers) made in England. 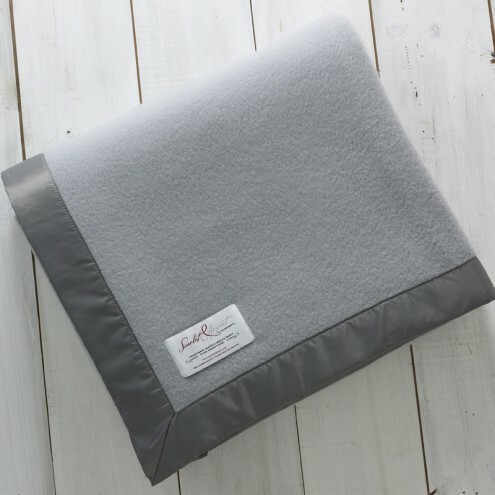 Scarlet and Argent Chamber Blanket – grey. Made in England. John Lewis wool holey blanket. Made in Britain. Photo by author. John Lewis wool holey (cellular) blanket. Made in Britain. 2. Photo by author. 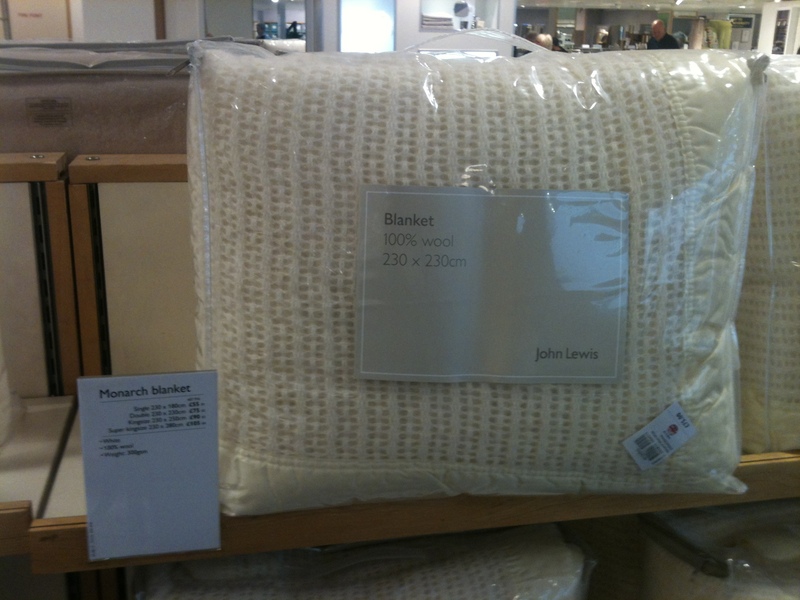 John Lewis pure new wool blanket. Made in Britain. Photo by author. John Lewis merino wool blanket. Made in Britain. Photo by author. 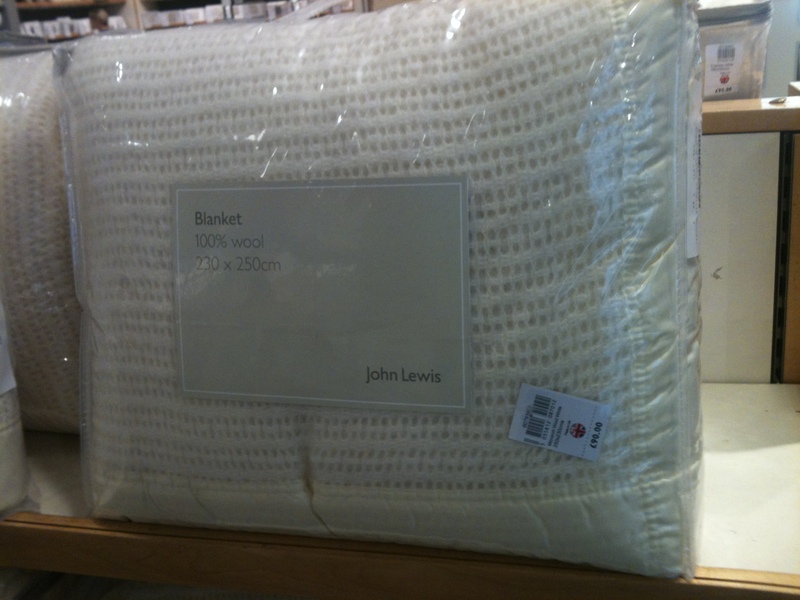 Some John Lewis blankets are made in Britain. 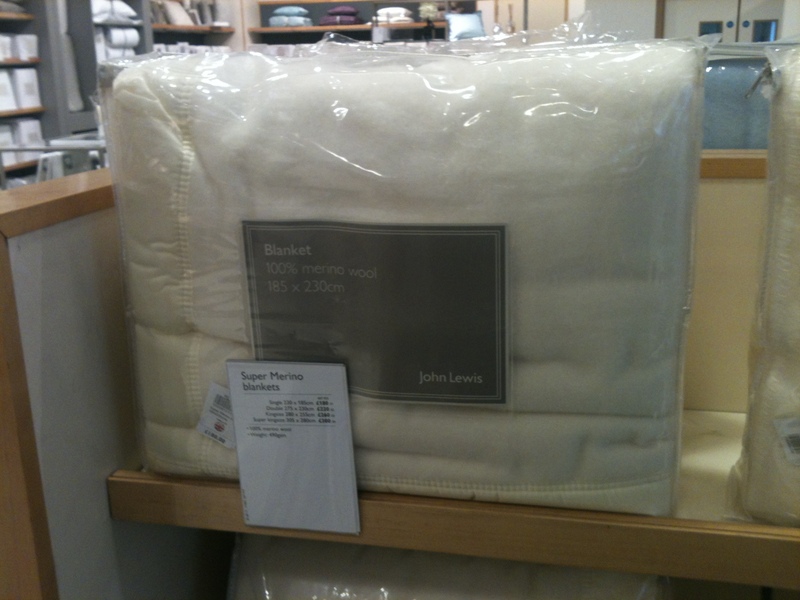 John Lewis is one of the few retailers still selling British made blankets. 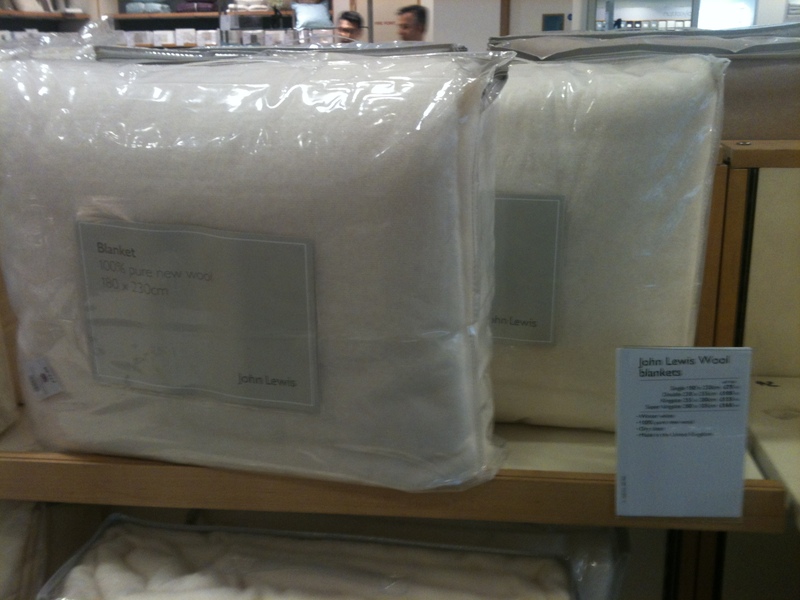 John Lewis UK made blankets are excellent quality and reasonably priced. This entry was posted in Blankets, Cushions and Soft Furnishings, Home Furnishings, Horse Blankets, Insignia and Regalia, John Lewis, Knockando Woolmill, Royal Warrant Holders, Scarlet and Argent, Wool and tagged Abraham Moon & Sons, Blanket, Blankets, Blankets made in the UK, Boswell's, British blankets, British made blankets, British Wool Blankets, Bronte, Bronte by Moon, Bronte throws, Cambrian Woollen Mill, Cellular blankets, Cushions and Soft Furnishings, Daniel, DreamGB, Fabrics, FelinFach, Fox Brothers, Friday Fox, Green Grove Weavers, Hainsworth, Hainsworth Textiles, Hot Water Bottle Covers, Jacqueline Poncelet, Jane Beck Welsh Blankets, John Lewis, John Lewis blankets, Just Wool Textiles, Knockando Mill, Lala and Bea, Made in England, Melin Tregwynt Mill, Mine! London, Molly & Monty, ODD, Quiltex, Royal Warrant holder, Scarlet and Argent, Solway Blankets, Spring Valley Mills, Teddy Bears, Textile Mills, Textiles, The Merchant Fox, The Tate Gallery Shop, Throws, Tripster and Smith, Tweedmill, UK made blankets, Watershed Brand, Witney Blankets, wool, Wool Blanket Online, Woollen blankets on June 23, 2013 by ukmade.